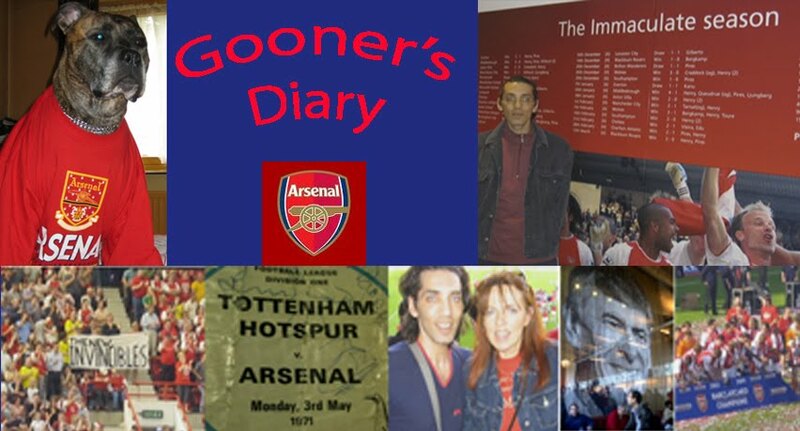 Gooner's Diary: Champions League...Now We're Really Having A Larf! Champions League...Now We're Really Having A Larf! I only discovered on Sunday afternoon that the Irish Examiner weren't expecting a Terrace Talk missive from me this weekend (with us playing on Monday night) and I was already 515 words into the following piece, when they suggested I limit my submission to 500 words. So you'll have to forgive me if I've short-changed you on this week's diary entry, in my efforts to wrap the following up as succinctly as possible. With brevity hardly being my strong suit, this was quite a challenge. I also have to apologies if I've repeated some of the sentiments expressed in midweek but I definitely didn't want to get into yet another Wenger (Gervinho, Podolski, Ramset et al) bashing. Knocking Wenger is tantamount to banging one's head up against a brick wall each week. The only pressure le Prof is under, is the pressure he puts on himself and that's probably one of the biggest problems at the club nowadays. AW is such an autocrat at the Arsenal that there is no one capable of making him aware of quite how stark bollock naked our Emperor appears, every time he comes out and publicly reiterates his belief in the quality of such a mediocre looking squad. Can anyone ever recall an incidence of a board getting shot of a manager because he declines to dip into their ever increasing bank balance? Besides which, even if the suits at the Arsenal should begin to get a little twitchy, if the number of empty seats continues to increase in direct proportion to the number of goals conceded as an inevitable result of our positively moribund zonal marking system, can you honestly envisage the scene in which Gazides, the MD who was interviewed by Wenger for his job as our manager's boss, finds the cajones to pull club's greatest ever servant into his office, to advise him that his time is finally up? In season's past, I wouldn't be panicking just yet, as I'd be looking at our next five Premiership fixtures, thinking that we should be perfectly capable of pulling our socks up by the time FA Cup 3rd Round comes along and that this will enable us to head into the New Year with a bit of momentum. Sadly nowadays we go into every game, praying our opposition might be more out of sorts than ourselves and with Reading having hit the bottom of the table over the weekend, you can bet they're not about to roll over for us on home turf tomorrow night. The only feint consolation in an exhausting seven hour round trip trek to Bradford in the freezing fog, to endure the sight of a full-strength Premiership outfit having their pants pulled down and their bare arses well and truly smacked by the lowly Bantams, is that whatever else transpires this season, it simply can’t get any more embarrassing for the Gunners than that. The welcome we received in West Yorkshire was as warm, as the weather was brass monkeys. For those of the 4000 lunatic Gooner suckers for punishment who arrived early enough to bag one, there were free Santa hats laid out on our seats, as part of the effort made by our impoverished hosts, to try and create a big, cup final type occasion of their brief moment in the footballing limelight. If I’m entirely honest, when I contrast quite how much our fans and the team would’ve taken the result for granted, if this game had run to form, with the euphoria of the fulfillment of a rammed Valley Parade’s not so far-fetched fantasies and a potential career highlight for many of the Bantam’s journeymen pros, I couldn’t really begrudge them their momentous night of giant-killing glory. It wouldn’t have felt nearly so bad if we’d merely been victim to bad fortune, as opposed to this season’s most blatant demonstration of the obvious limitations of our current squad. Perhaps the most telling appraisal of an Arsenal team, with a cutting edge that is no less blunt than the likes of Torquay, came as were consoled by the jubilant locals on our miserable, hangdog trudge back to the motor. They’d turned out on mass to support their team against the mighty Arsenal and they all seemed genuinely mystified and more than a little disappointed that a regular amongst Europe’s elite, containing an assortment of International stars, who cost umpteen millions more than the combined value of their entire squad, could produce no more threat and offer little more entertainment value than any of their regular 2nd division opposition. But then we’ve been asking ourselves this same question for far too long! Whether Wenger’s team selection was a reflection of his desire to relieve the pressure, by throwing us a League Cup bone, or an effort to instill some much-needed confidence in our beleaguered troops, by banging in a few goals against lower league opposition, whatever the motive, le Prof’s plan seriously backfired. As I listened to the announcement of our line-up, while queuing for a hand-warming cup of Bovril, my prevailing reaction was not just surprise but I was left feeling more than a little cheated. In recent seasons our League Cup campaigns have often proved a highpoint, a welcome touchstone to the real thing and a breathe of fresh footballing air, outside of the rarefied hype within the artifice of the Premiership bubble. Whatever the outcome, one could always rely on the refreshing pleasure of experiencing the eager “have a go” exuberance of assorted youngsters, with plenty still to prove. By comparison, after the madcap excitement at the Madjeski in the last round, it was unbearably frustrating to endure yet another low-tempo display, as we sat back waiting for our quality to win out, without anyone willing to grasp the mantle and make something happen. Having been in touching distance of a day out at Wembley, the long journey home afforded plenty of time for the realization to sink in that the Gunners had just blown our best opportunity of ending our silverware drought. Moreover, where in the past one might’ve expected the sort of positive reaction to our humiliating cup exit, in five subsequent bankable Premiership fixtures, on current form the Gunners will inevitably make a meal out of the meekest opposition. It’s hard to believe that we’ll be travelling to Reading this evening more in desperate hope of some redemption, than in expectation.